Left: Immunogold micrograph. 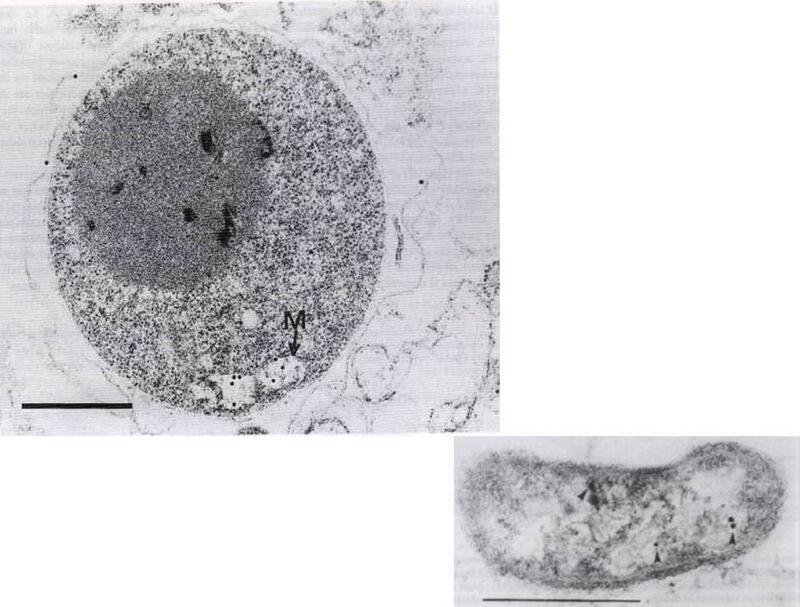 The mature parasitic form with a mitochondrion (M), isolated from its host cell was labeled with anti DHODase antiserum. Number of gold particles were observed inside the mitochondrion. A few gold particles were found throughout the section. Bar – 1 mm.Right: Immunogold labeling of DHODase in isolated mitochondrion.Krungkrai J. Purification, characterization and localization of mitochondrial dihydroorotate dehydrogenase in Plasmodium falciparum, human malaria parasite. Biochim Biophys Acta. 1995 1243:351-60.